CHARLESTOWN, Nevis – The Honourable Mark Brantley, premier of Nevis and minister of finance in the Nevis Island Administration, says revenue derived from tax collections at the Inland Revenue Department (IRD) for the first six months of 2018 shows a significant increase compared to the same period in 2017. 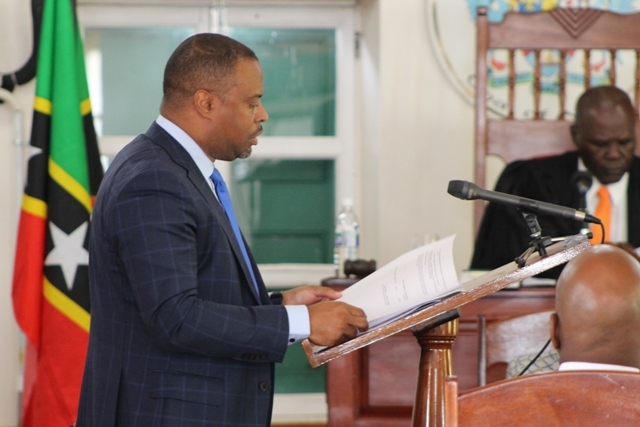 Brantley made the disclosure at a sitting of the Nevis Island Assembly July 3, when he, as minister of finance, was seeking to amend a section of the Tax Administration and Procedures Ordinance related to tax collections. The finance minister believes the increase is an indication that the NIA is moving in the right direction as no new taxes have been introduced and the same taxes are yielding more, which he attributes to the positive response of taxpayers. the business and occupation license grew by 4.7 percent over the same period in 2017. So far, $546,874 has been collected for 2018. With a variance of 4.7 percent, $24,500 more has been collected over the $522,000 collected in 2017. For the corporate income tax, $3.4 million was collected for the first six months in 2017. However, so far $3.6 million has been collected in 2018, with a variance of 5.66 percent. In the area of property tax, $1,036,335.12 has been collected for the year so far, representing an increase of $724,452.04 or 36.53 percent over collections of $1.9 million for the corresponding period in 2017. For the unincorporated business tax, $1,036,335.12 has been collected for the first half of 2018, representing a 7.32 percent increase over the $965,619 collected in 2017. The value added tax has seen collections of $11,707,832.29, representing an increase of $1,081,313.19 or 10.18 percent over the $10,626,519.10 collected for the corresponding period in 2017. Brantley also used the opportunity to give an account of the actual revenue collected over the past six months in relation to the NIA’s budgeted revenue for 2018 and commended the officers engaged in tax collection. “I just wanted to report that the actual revenue that we have achieved thus far for the first six months of 2018 is $34,574,403.67, that we have surpassed our budgeted revenue of $32,729,919.85 and so, we have, for the first six months, registered a surplus of $1,843,483.82 or 5.6 percent over the budgeted revenue. “I believe that commendations are due to our Inland Revenue authorities, the tax collection department and commendations are due to our taxpayers, our residents who are clearly demonstrating that they are being responsible citizens. That, for us, is very important,” he said.